India has one of the oldest civilizations in the world. Excavations trace the Indus Valley civilization back for at least 5,000 years. This civilization, an urban society of a very high order, flourished in North India during the late 3rd millennium BC. From the word "Indus" came the name "India". It was called "Sindhu" by the natives, but the Persians who found difficulty in pronouncing the name, called it Hindu. Aryan tribes, speaking Sanskrit, invaded from the North West around 1500 BC., and merged with the earlier inhabitants to create classical Indian civilization. India was first unified under the Mauryan dynasty in the 4th cent. BC. It was only the Northern part thus consolidated (with parts of modern Afghanistan) into an empire by Candragupta Maurya, founder of Maurya dynasty (c. 322-185 BC.). Asoka the Great (d. 232 BC. ), grandson of Candragupta Maurya, extended his empire by addition of kingdoms of Bengal and Orissa to include over two thirds of the peninsula, all but extreme southern part. Later empires under the Guptas (4th-6th cents. AD), the Delhi Sultanate (13th-14th cents. ), and the Moghuls (16th-18th cents.) also brought much of India under one ruler. Arab invaders established a Muslim foothold in the West in the 8th century AD, and series of Muslim invasions began around 1000 AD. in North. With the arrival of Portuguese navigator Vasco da Gama in 1498, the Portuguese monopolized in 16th cent. and for which Dutch, English, and French competed in 17th cent. However, the Moghul emperor Baber conquered India in 1526, and this Muslim dynasty founded by Baber ruled India until 1857. 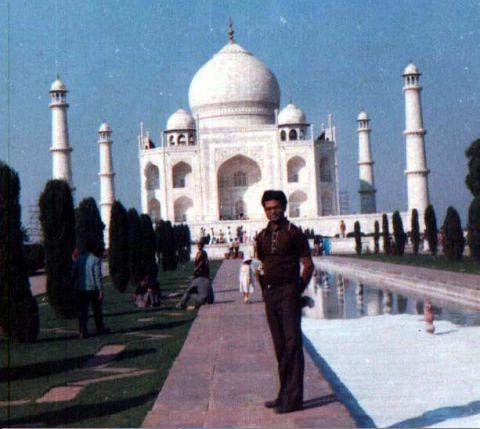 It was during this time the famous monument Taj Mahal was built by the Moghul emperor Shajahan. Torn by dynastic conflicts, Moghul power began to decline, and this opened way for European intervention. The British finally assumed authority over "the Jewel in the Crown" in 1857, although Queen Victoria did not assume the title of empress until 1876. Nationalism grew rapidly after World War I. The movement for independence from Britain began in the late 19th cent. The Indian National Congress and the Muslim League demanded constitutional reform. A leader emerged in Mohandas K. Gandhi (called Mahatma, or Great Soul) who was born in 1869 and assassinated in 1948. He advocated self-rule, non-violence, removal of untouchability. In 1930 he launched "civil disobedience," including boycott of British goods and rejection of taxes without representation. In 1935 Britain gave India a constitution providing a bicameral federal congress. Muhammad Ali Jinnah, head of the Muslim League, sought creation of a Muslim nation, Pakistan. In the 20th century, increasing unrest led to Britain's withdrawal and independence for the country on August 15, 1947. Conflicts between the Hindu majority and the considerable Muslim population, however, resulted in creation of two separate states (India and Pakistan) when independence was granted. 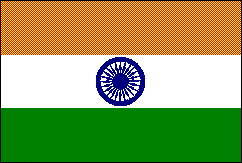 India became a self-governing member of the Commonwealth and a member of the UN. It became a democratic republic on Jan. 26, 1950. India is a birth place of four religions: Hinduism, Buddhism, Jainsin and Sikhism. Brahmanism (Hinduism), with its accompanying social caste system, evolved from the Vedic religion of Aryan invaders. Hinduism is a mode of living of one particular people rather than an international missionary religion, spread amongst peoples of different races, cultures and climes. Buddhism was founded around 567 BC. by Gautama Buddha who achieved spiritual enlightenment at Boddh Gaya, in northeastern India. He was moved by the desire to end human misery. Sum total of the teachings of Buddhism can be summarized as deliverance, and the final deliverance is nirvana, the perfect and incomparable bliss. Around 557 BC, Vardhamana Mahavira (599-527 BC), a contemporary of the Buddha, achieved enlightenment, and founded Jainism that arose in opposition to Brahmanism in the period of ferment. The final and highest law of Jainsm is ahimsa (non-violence). Asoka, converted to Buddhism, promulgated a state religion combining elements of both Buddhism and Jainism. Hinduism eventually became the dominant religion of India, and later it became state religion; Jains and Buddhists were persecuted. The impact of Islam gave rise to several new Indian sects that preached against idolatry, polytheism and caste. The most important sect that arose out of this fusion was the Sikh community founded by Nanak (1469-1538), a Punjabi, born in Talwandi in Lahore District, now in Pakistan founded Sikhism. In addition to these faiths, we can note the presence of other religious groups. Jews came to India before the destruction of the second temple in Jerusalem. Without doubt there was a wide dispersion of the Jews in the years following the great disaster of AD. 66-70. There were Jewish colonies in Malabar in the first century AD. Christianity in India is as old as Christianity itself. It was brought by St. Thomas, a disciple of Christ himself. India's earliest contact with Islam began in the first quarter of the eighth century mainly through the Arabs who subsequently conquered Sind, the north-western frontier province and portions of Punjab. A small Zoroastrian community, now generally known as Parsis, also found home in India after the beginning of the Christian era, possibly around the 8th century. Officially it is also called Indian Union or Union of India. In Sanskrit it is called Bharat. It is the second largest populated country in the world after China. 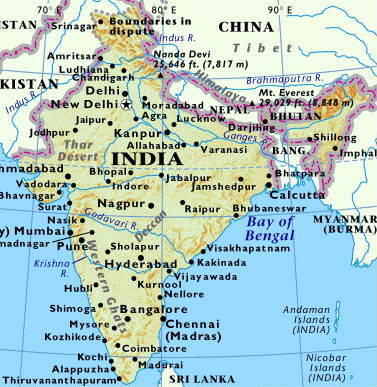 The country may be divided into three well-defined regions: (a) Himalayan region in the north, (b) Gangetic Plain between foothills of the Himalayas and the Vindhya mountains, and (c) plateau region (Deccan Peninsula) in the central and the south. The climate varies from tropical heat in the south to near-Arctic cold in the north. While Rajasthan has a desert in northwest, Assam Hills in the east get 400 inches of rain a year. Population: 952 million, Population density: 779 per sq. mi. Ethnic groups: Indo-Aryan- 72%, Dravidian- 25%, Mongoloid and other- 3%. Literacy rate: 52.1%; 63.9% for males, and 39.4% for females. State of Kerala has 100% literacy. This is the only state in the world that achieved this status, and it is recorded in the Guinness Book of Records. Religions: Hindu- 82%, Muslim- 12%, Christian- 3%, Sikh 2%, Buddhist, Jain, etc.- 1%. Religion has affected every part of Indian life: the festivals, the clothes, the food, the buildings, and the folklore. Main Cities: Bombay (Mumbai)- 13 million, Calcutta- 12 million, Delhi (Capital city)- 9 million, Madras- 6 million, Hyderabad- 5 million, Bangalore- 4 million. Government: Federal republic; Head of state: President; Head of government: Prime Minister. Local divisions: 25 states, 7 union territories.